We had such a great day today! I decided this morning to take a break from painting today and really focus on the kids, on school, and on making our day fun. It's easy to have fun while doing schoolwork when you homeschool. Getting up and moving around; with three boys this is a must! Looking for evidence of learning even when we're not "doing school"
While the boys watched Big Giant Swords on the DVR, I looked up some things to do on Pinterest. We all sat down to eat breakfast together and I read another chapter in Harry Potter. As soon as we were done Alec asked if he could read in his room. He happily took off and we didn't see him again for at least another hour. Ian jumped in with Evan (literally) as they jumped around the house from sight word to sight word practicing Evan's reading skills. They laughed a lot and had lots of fun. Evan and I sat down to play a math game called Round It. We used playing cards from 1-10 and picking two cards made up a two digit number. We pulled out the hundreds chart and I showed Evan that numbers ending in 5-9 are closer to the next larger group of 10 while numbers ending in 1-4 were closer to the lower grouping of 10. We each picked two cards, made up a number and then told what we'd round them to. He was doing amazingly well and then out of no where made a mistake. I didn't really think anything of it until I saw the sly look on his face. I asked him if he had made it wrong on purpose and he admitted that he wanted to get one wrong too so I could catch up to his score-- what a sweetie! He enjoyed this game a lot and it was a fun way to learn about rounding. We talked about why we round and how much easier it is to add 20 +30 in our heads rather than trying to add 16+ 29. He went on to work on a printable Valentine's day survey next and he immediately asked if he had to write all the answers. He hates to write and has started to rely on my doing it all for him. I suggested we take turns and write the answers to every other question. His first answer was hot dog and I started spelling the words for him automatically. I stopped myself though and ended up asking him if he new how to spell dog and he did! I had no idea he knew that! Come to find out he's also perfectly capable of spelling the words- for, me, and WiiU too! And those are just the words I thought to ask him about. As soon as we were done writing he turned to me and asked, looking rather stunned, "I just have to read a book and I'm all done school?" I explained that we had played a sight word game, did some writing and spelling, and had played a math game so, yeah, reading was pretty much all that was left! He doesn't like any of the books we have right now in his reading bin and just wants to re-read some of his Biscuit books or others that we've already read. I encouraged him to try something new though. We had a book about opposites and once I showed him that there was only one word on each page he was completely on board and excited about reading. It ended up being rather difficult as many of the pictures weren't real cut and dried about what they were showing. We had to use a lot of our decoding skills and find a lot of smaller words within the bigger words (like picking out an and then ant out of the word slanted). He did great though and liked the book enough to want to bring it up to his bedroom to read again later. He went to get ready for the day and started hopping on his sight words back to the stairs. Once he reached the stairs he yelled out "stair" and started up. I was right behind him and told him I had almost put the words on the stairs. His eyes lit up and he asked me why I hadn't done that. I told him I would one of these days. Maybe I'll get up early and surprise him with a trail of words from his bedroom door to the kitchen table. I had a math game set up for the older two boys too and Ian got annoyed with waiting around for Alec to finish reading. I offered to play with Ian instead and we played three rounds of fraction war. We each flipped over two cards placing the larger number on the bottom. We reduced our fraction if we could and then compared them to see whose was larger. Ian won each time and worked really hard at reducing them. Alec FINALLY came downstairs after much prodding from his brothers. He wanted to play fraction war with Ian. Ian and Alec actually had a war while we were all playing (finding that 1/3 and 3/9 were the same!). Alec ended up winning our game and did really well reducing fractions. I wasn't sure how well he would do with the game since he hasn't had nearly as much practice with fractions as Ian has. But not all that surprising he caught on really fast. With all our core subjects out of the way we set up to play Ancient History Memory. I had ordered this game from Amazon a few days ago for something new to play while learning about history. All of the pictures are labeled and so today we just learned names like Socrates, Augustus Caesar, and the Parthenon versus the Pantheon. I was hoping that in hearing about some of these names or places they'd be interested in learning about them at some point. We all started playing but Evan got discouraged pretty quickly and decided to drop out of the game. Ian, Alec and I played until we had scooped up all the cards. I ended up winning but we all had a lot of fun playing and trying to beat one another. We ate some lunch and I finished up our book Lewis and Clark and Me. After lunch we packed up and got ready to head out to the book store. 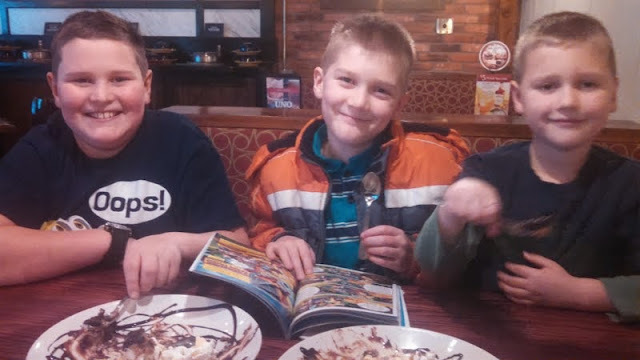 Remembering how much the boys enjoyed our last trip there, I offered to take them all to the store and buy snacks for us to eat while looking at books. We spent over an hour and half pouring through the books in the kids' section. I agreed to buy them each one book but we looked at loads of them. Many books we just sat on the floor and read right there. We found a book about Ancient Greece and Alec decided that he wants to study that for the history/ geography fair and tie it all in to the Greek Gods as well. So we added that book to our pile too. We had a ball! 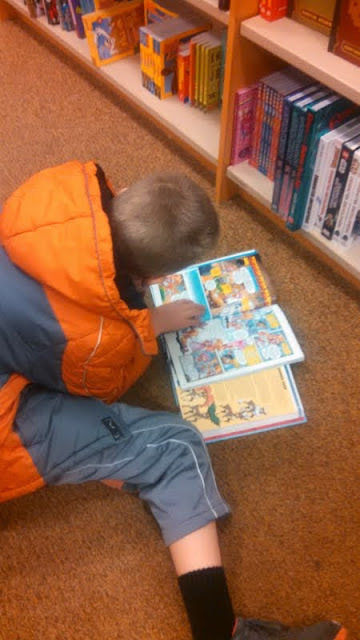 It may not have been something I would normally have considered as a fun field trip but my kids just loved visiting Barnes and Noble. I'm not sure Alec ever made it past the first shelf but we often brought books over to him that we thought he might enjoy. It was a fabulous afternoon and Ian added up all our purchases before we got the register. He was pretty close to the total cost and I just love that he always tried to figure out the approximate cost of our purchases. Today he rounded everyone's book purchase to the nearest dollar and added them all up. He was only off by the tax. Something he still doesn't automatically think to add to the total cost yet. We ended up deciding to head right to Pizzeria Uno for our snack. We ordered two yummy desserts for us all to share. We ordered their Oreo brownie dessert and their peanut butter cup dessert. Alec was engrossed in his new book and only looked up here and there to take a few bites and to pose for a picture for me. We talked about manners, about how sharing a dessert is different than having our own, about restroom safety (when we're young) and travelling in pairs, and Ian even got another lesson in figuring out the tip. 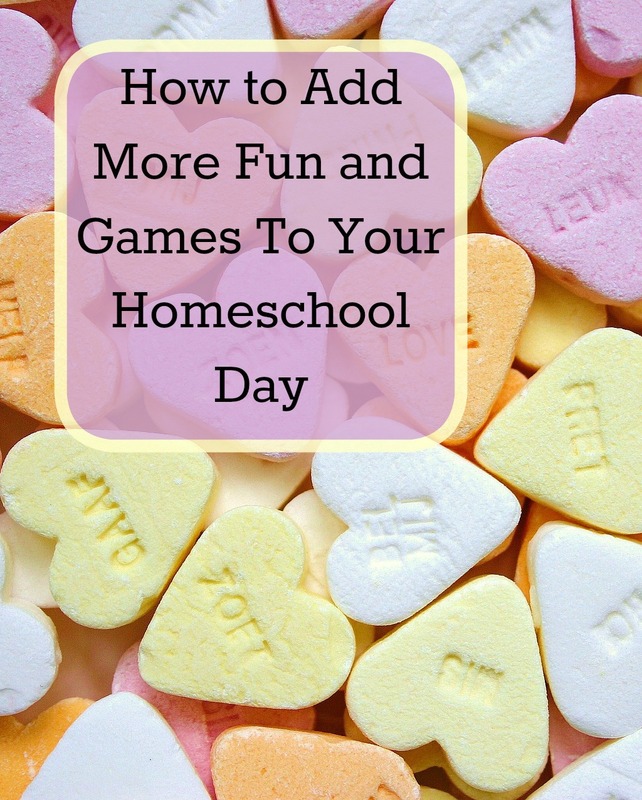 I never think of these types of things when I plan our outings; my only goal was to have a nice, fun day together as a family but I do tend to take more note of these types of lessons the more we homeschool. All these small mini- lessons really add up over time and help shape my boys into the kind of men that I'd like to see them all become. Ian was drawing on CAD again and made a bulldozer and the number 10. By that time it was way past school hours but we're always learning; morning, day, night, Monday, Tuesday, Saturday, Sunday-- it doesn't matter. Learning happens all the time. I've learned that you just have to train yourself to look for it, recognize it and know when to capitalize on it and when to just observe it and let it be. I think today was a perfect day for us all and I saw my boys laughing, learning, sharing, and enjoying one another's company. It doesn't get any better than that.